On Fridays, I post some of the more interesting articles I’ve come across throughout the week to highlight what’s happening in the world, the US, the church, in the world of religion, sports, and in culture in general. My dear brothers and sisters, Greetings in the precious name of our Lord and Saviour Jesus Christ! Song of the Week: Our Great God by Fernando Ortega, featuring Mac Powell of 3rd Day! Weekly News wrap-up : Friday February 14th 2014 Special Olympic / Valentine’s Day version ! On Fridays, I report on the events of this past week to that are interesting and important to us citizens and Christians. World: Belgian lawmakers extend euthanasia to children. SOCHI, Russia — If U.S. head coach Dan Bylsma had written down a list of things he hoped in his wildest dreams might take place during his team’s first Olympic game against Slovakia, let’s put it this way: He’d be fresh out of check marks. Youthful defense showing no jitters? Check. Dominating work in the faceoff circle? Check. 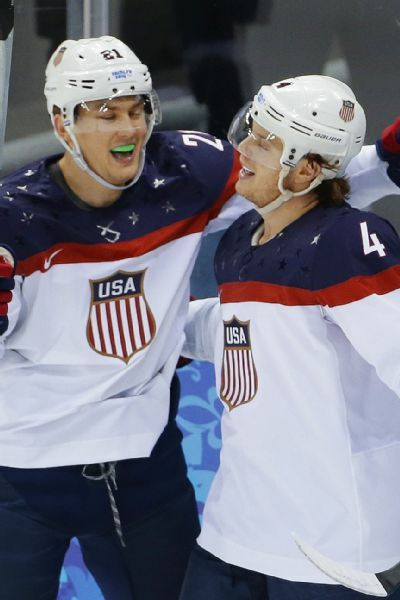 AP Photo/Matt Slocum John Carlson was the first of six goal scorers for the Americans. Staying out of the penalty box? Check. Up-tempo pace that kept the Slovaks on their heels from the get-go? Check. A six-goal second period en route to a 7-1 thrashing to start the tournament? Check. Take the next three days and reflect on this Sunday’s text that will greatly encourage us in the Battle which Christians are all participants in! Hebrews 12:1 – 3 1 Therefore, since we are surrounded by so great a cloud of witnesses, let us also lay aside every weight, and sin which clings so closely, and let us run with endurance the race that is set before us,2 looking to Jesus, the founder and perfecter of our faith, who for the joy that was set before him endured the cross, despising the shame, and is seated at the right hand of the throne of God. Answer (bold is for children): Personal, perfect, and perpetual obedience; that we love God with all our heart, soul, mind, and strength; and love our neighbor as ourselves. What God forbids should never be done and what God commands should always be done. On Fridays, I (attempt to) bring the events of this past week to us in that are interesting and important to us citizens and Christians. Enjoy! World: Ready or not, Sochi is now the World’s Stage. SOCHI, Russia — Already stringent security measured appeared to tighten even further Friday in the run-up to the opening ceremonies of the Winter Olympics. Anglican News: Archbiship of Uganda issues statement on Church of England’s “Pilling Report”. SEATTLE — Fresh off spending more than two hours winding his way in front of a parade crowd that surpassed the population of Seattle, Pete Carroll was ready for the postseason to finally arrive. We glorify God by enjoying him, loving him, trusting him, and by obeying his will, commands, and law. 1. Who are our real enemies? What does Paul tell us about them? 2. How does Paul express the proper combination of divine enabling and human cooperation in the area of spiritual warfare? 3. How would you answer someone who doubted the existence of the devil? 4. What is the purpose of the Armor of God? 4. List the six pieces of armor. What does each one signify? What weapons of the devil do they protect us against? 5. Can you identify any chinks in your armor? What changes do you need to make in your life in order to become fully equipped? 6. Prayer… is to pervade all of our spiritual warfare. Why? 7. How does your prayer life look in light of Paul’s guidelines in vs. 18? 8. What does Paul ask for himself? Why?